I’m going on holiday biaaatches! Today I’m off to the airport to jet off to Gran Canaria. I know I’m a bit late with the holiday theme posts but I suppose that’s just the way it goes – Jamie and I have opted to go on holiday in September for the last 2 years. Let me tell you it is SO good seeing everyone else jet off on their holidays all summer knowing yours is still to come! I also managed to cop allll of the summer sale goodies last week just in time for our trip. Today I thought I’d share some of my must haves in my hand luggage this year. If you’re interested in more travel blog posts, you can see them here! Hand cream and vaseline. Is there anything worse that spending an entire flight with dry lips and hands? These live in my bag all the time, not just when I’m travelling. Hairbrush. Travelling means sleeping. Sleeping means bed head hair. This Tangle Angle brush isn’t only the most beautiful brush I’ve ever seen but saves me from the ‘dragged through a hedge backwards’ look too. Sunnies. For when you hop off that plane and the sun be blindin’. A good read. Books are always needed on holiday. 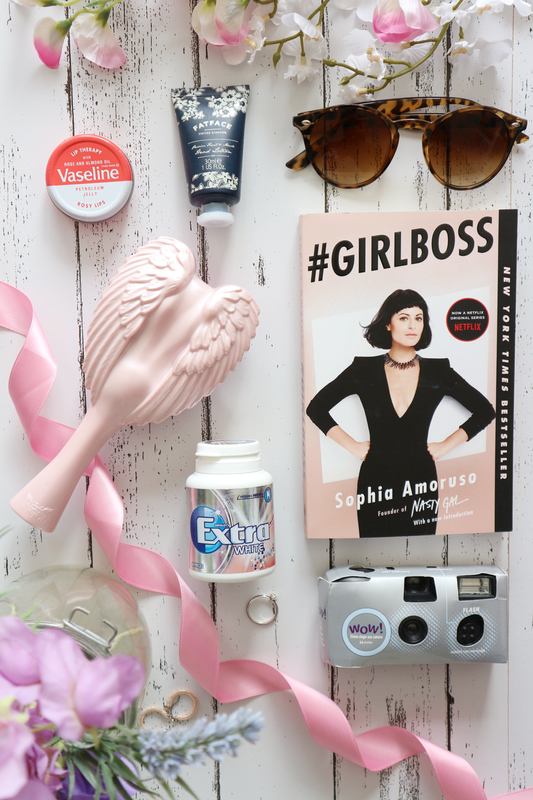 I end up going through so many when I’m by the pool, so this year have my kindle to save precious luggage weight and room, but I will be taking #Girlboss with me – something I’ve been saving until now to read! It seems like every blogger and their nan has read this so I’m excited to see what the hypes all about. Gum. I always like something to chew on for take-off to help save the ear popping, and gum is a bit of a handbag staple anyway. Disposable Camera. I’m a bit of a disposable camera junkie – I blooming love snapping moments and having that excitement of not knowing how they’ll turn out, it’s something that will always be quite special. Of course this will have to be in my bag, as it will be all holiday to capture all the special memories. What’s in your travel bag? Have I missed anything? "Spend vs. Save Dry Shampoo"